At soccer’s World Cup, on the pitch 11 players per side from 32 nations battle for the ball and a trophy. But outside the lines, marketers and broadcasters fight for the eyeballs and attention spans of billions of people from around the globe. 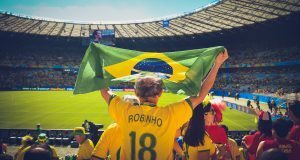 No matter which nation wins the quadrennial tournament now underway in Russia – and to be hosted by the United States, Canada and Mexico in 2026 – the champions in dollars and cents will be the sponsors that expose their products to a universal audience and the broadcasters who relay games to the world. 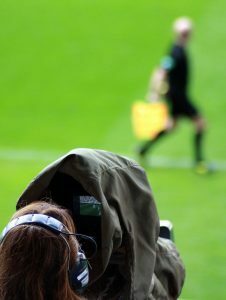 “The big moneymaker will be FIFA (soccer’s world governing body) from broadcasting rights and the corporate sponsorships. 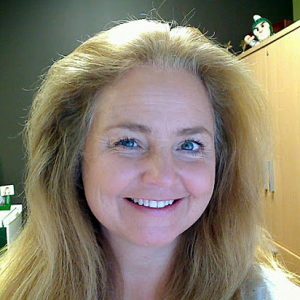 Other industries that benefit are construction, and travel and tourism industries,” said Sherri Henry, the associate director of undergraduate academic services at the Broad College and program director for the college’s “Business of the Olympics” education abroad program. That program, offered during Olympic years, looks at that so-called “mega-event” overseen by the International Olympic Committee (IOC) and its economic impact. That’s because such events are not just something to see; they have become places to be seen. For the Olympics business program, which took place earlier this year during the Winter Olympics, “we would look at the Opening Ceremonies and think about the host city. 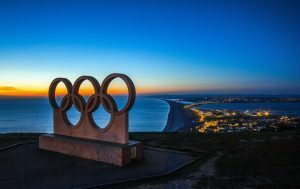 We look at business models for any business connected to the Olympics, whether it be a world sponsor or whether it be a local business,” Henry said. Those lessons learned apply widely to events like the World Cup. Compared with the recent Olympic Games, the World Cup struggled this year to fill its sponsorship lineup, in the wake of a bribery scandal at FIFA. Some high-profile sponsors like Sony have pulled out. While an association with FIFA pushed away some traditional corporate heavyweights, those absences opened up room for lesser-known ventures wanting to be associated with FIFA’s World Cup. A number of Chinese companies have jumped into the void, including Hisense, a China-based HDTV manufacturer. The marketing boost can extend to the host communities as well, as hosts are put in a global spotlight. Henry’s class looked at past Olympics host Vancouver, Canada, and the nearby ski resort town of Whistler. But that exposure comes at a price: the cost of building up stadiums, mass transit systems, airports, hotels, and the infrastructure to host visitors from around the world. That impact can linger. It took Montreal, Canada, 30 years to pay off the debt from the 1976 Summer Olympics. “Still, you have people who just love the Olympics and are happy that their cities were in the global spotlight for a while,” Henry said. For the U.S. World Cup in 2026 and a Los Angeles Summer Olympics scheduled for 2028, that impact is expected to be more minimal, as solid infrastructure is already in place. “But the restaurants and existing local businesses that were already established who had typically received their produce at certain times, they had to reroute everything because the roads were closed” for the pop-ups. Deliveries were restricted to just a couple of hours per day, Henry said. “They certainly made money in that they had a lot of customers, but it was a compromise” with the disruptions. There is also a loss of regular customers, who take “flight from the city. People think there is going to be this influx of visitors – which there is – and they don’t want to be part of that. They don’t want to have to deal with the traffic; they don’t want to have to deal with it. So they leave.” In turn, that is creating a moneymaking opportunity for everyday residents via gig economy stalwarts like the Airbnb lodging-sharing service. Despite the headaches for locals, the allure of mega-events is hard to pass up. That’s what Henry found in surveying businesspeople in Sydney.